JuliaBobbin: Project Sewn Results + Mood Fabrics Voucher GIVE AWAY!! Project Sewn Results + Mood Fabrics Voucher GIVE AWAY!! Oh my gawd you guys! I came second in Project Sewn! Release the doves!! Thank you SO (sew) much to all of you who followed along and voted! As a special thank you I am giving away two $50 vouchers to Mood Fabrics. If you don't know already, Mood is the fabric store for Project Runway in the U.S. and they now ship internationally too. Two lucky peeps will be randomly selected and each will win one $50 e-voucher. Remember my 'A rose is a rose, is a rose, is a rose' dress? Well there's a movie out at the moment called 'About Time' and the dress in the promo reminds me a lot of my dress! You can learn how to make these rose sleeves with my tutorial here. Saw the amazing how-can-one-person-be-this-talented Jill Scott at the Palais Theatre and almost hyperventilated it was THAT GOOD. Oh and guess what I did this weekend? Oh ... you know, just had brunch with the talented Leisl from Jorth and the inspiring Kristiann from Victory Patterns and her wonderful partner Simon. Nothing much! Needless to say I had an amazing time and my face is still sore from all the epic smiling and talking! Thanks again to everyone for your support through Project Sewn. Your words of support made me feel all sorts of warm and fuzzies and I feel very lucky to be part of such an encouraging and positive community. Congrats, you obviously put a lot of hard work into those dresses and totally deserve it. What project next? What a fun day, and a fun giveaway! Very well done! 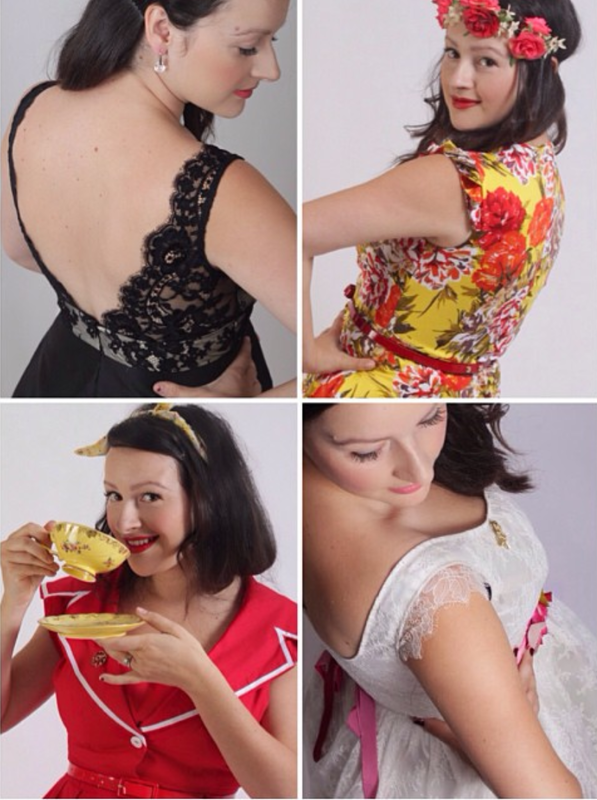 I adored all of the dresses you entered for Project Sewn. Thank you for offering such a great giveaway! I love following your blog and seeing your creations. You definitely inspire me to try new things and I am so proud and happy for you for your achievements! The dresses you created for the Project Sewn were Super gorgeous and thanks for doing this giveaway! Congratulation Julia. I voted for your dresses. Great giveaway! Congratulations! I absolutely loved all your dresses - so classy and stylish! Wow, awesome giveaway! I'd love to be entered. Congrats on project sewn!! It was fun watching your projects throughout. Amazing! I've been so inspired by your sewing. Congratulations! Pips. Congrats on coming second. What a fantastic achievement. How exciting! Big congrats Julia, your entries were all gorgeous. Congratulations, your makes are amazing! Congratulations Julia - I thought your dresses were just beautiful and deserved a whopping big spotlight on them! Congrats! I loved the dresses you made especially the black lace one. Congrats on second! You should be proud! And thank you so much for the lovely giveaway! Your dresses for project Sewn were all great! Great news that Mood now also ships internationally! I didn't know that, I checked them out a while back and was disappointed then that I couldn't order anything. You should have won first place…but of course I am biased!! Way to go! I loved being able to vote for you! Ohh…and I'd love a Mood GC! your dress is way better than rachel mcadams! congratulations on the project sewn place. You have such a distinct style! Great job on project sewn! Fab frocks! It seems that Mood could be the holy grail of fabric stores. I'd love to go one day in the meantime a voucher would be great. You should've come in first! And I think the costumers of About time saw your dress and decided to copy it. Maybe Mood shipping internationally now is not such a good thing for my fabric addiction but with the voucher it would be free so it would't count! I love to see all of your creations they are amazing and inspiring. Congratulations - your dresses are very beautiful! Thanks for the chance to win the Mood vouchers! Congrats for this great adventure ! Your garments are always such a nice inspiration. I voted for you with a conviction that you were the unquestionable winner, I strongly believe you were the best! Still, the second place is also great:) Congrats! Congratulations! Your dresses were all so gorgeous, it was a treat to see them each week of the competition. I'm more than a little excited that Mood now have international shipping, I think I might put Mood vouchers on my Christmas list! Loved following your dresses, you photograph them so well! Very excited to find out that mood ship internationally, now I can do more than just drool over their insta gram! I loved all your competition dresses! Super excited to shop at Mood now they ship internationally. yay for mood shipping internationally! watch out credit card your in for a workout! congratulaton's on your win i really loved the yellow dress you made just stunning! Congratulations - well done you! congratulations.. it is well deserved! Oh congratulations! Your entries were all so beautiful, well done! Well done...... tough fight and you fought well (go the Aussie!). Your outfits were absolutely gorgeous. (and hallelujah that Mood fabrics now ship to over here..) My bank account balance just dropped dramatically. Congratulations, I loved all your outfits! Congratulations, I loved all the dresses. Congratulations! Amazing giveaway! I can't believe how similar that 'About Time' dress is to yours...spooky! Congratulations!! you well deserved it! *Doves and flower petals flying*...ps: I so want to see "about time", missed it in theaters, will try the dvd! a french fan,recently moved to uk! Congrats! And thanks for a giveaway. I'd love to win! Your rose dress looks way much better, by the way! I'm so glad you did project runway! It introduced me to your amazing talent...your sewing is amazing! What an honor! Congratulations, and many thanks for the giveaway. Congratulations, your dresses are just gorgeous!! Congratulations! Your dresses are beautiful and you are very inspirational. Congratulations! I thought your dresses were so fabulous and so very you! Congratulations, I loved your dresses so much! What a nice giveaway! Congratulations Julia! I loved following your dresses throughout the project. Thank you for running such an awesome giveaway! congrats Julia! I just love all of your projects! Congratulations on your second place, all your dresses were so gorgeous! Wow - 2nd place is amazing - congratulations! My little girl is a few month older than your little boy so I can appreciate how hard it must have been to put so much time into sewing these 4 dresses. It's such a juggling act but worth it - both sewing and babies! You came first in my books Julia! Keep up the great work. Looking forward to see what comes from your brain and hands next. Congratulations! I loved your little black dress. Your makes are always gorgeous, but the back of that one was stunning. Congratulations! I love your blog you inspire me to create one of my own to share my homesewn creations. I really thought you should have won 1st place. Congratulations! Your dresses are all beautiful! Congratulations Julia!!! Your work is always so gorgeously intricate and inspiring!! I adore your gorgeous dresses! Thank you for the chance to win! Congratulations! I'm looking forward to seeing your next projects! Congrats! And good luck everyone! I love Jill Scott, I bet that show was amazing! Your work was wonderful on Project Sewn. Wow that dress is echoing the rose dress. Congrats!!! And, my comment to put me in the running for a gift certificate. Thank you! All of your entries were simple marvelous. I watched and voted each week. Please enter me in the fabric contest. I'd love to have some Mood quality! Congratulations! You're such a talented girl! Your dresses were beautiful; I admired every single one of your entries. Thanks so much for the giveaway. What a great early Christmas present that would be. Congrats, but seriously you should have won. Your dresses were fabulous, from the conception to the final wonderful result. And bonus, it was obvious you had the number 1 happy personality! Congrats! All of you outfits were great but I especially loved your little black dress, so beautiful! Thanks for the awesome giveaway, I love Mood! It was so much fun seeing your creations during project sewn! I love every one of your dresses, and how they are so much "you". Congrats! I loved all your creations, it's always fun to see what people can come up with!! It's always so inspiring. Congratulations on the second place! That's awesome! I can't wait to see your next creation. Congratulations Julia! Your spring dress is giving me life! I've never sewn with lace, but I'm definitely going to make a pretty lace dress for next spring. And I love Jill Scott too. I've been a fan since her first CD and was lucky to see her in some pretty small venues here in NY. I still see her whenever I can and I've NEVER been disappointed. "Golden" is one of my all time favorite happy songs. Congratulations! I'm always inspired by how you use lace, and how intelligently and neatly you use it. I've been trying to get up the courage to try something similar. . . I've been following your blog for a few months and just want to congratulate you on making it all the way to the final of Project Sewn. Your garments fit you so well and look lovely on you. Congratulations! You did such beautiful work on Project Sewn! You can leave me out of the giveaway as I already own a horrifying amount of fabric from Mood, but I'm excited for the winners! 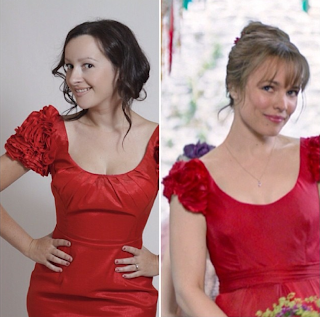 The red dress on Rachel McAdams looks so much like yours, only yours is prettier! Your makes were fabulous! Congrats! Your work is an inspiration for me! It is always so well fitted. Well done for getting second, and the costume designe obviously follows your blog! I would absolutely love to win and congratulations on coming is second place, you were wonderful! Your work is beautiful. Very inspiring! Congrats! I can't say i'm surprised you faired so well: you are bursting with talent! Thanks for the giveaway! Your creations are always fabulous and very inspiring! I love seeing your new makes! Congratulations! How exciting. I loved all your projects! Yeah I voted for ya. Congrats. 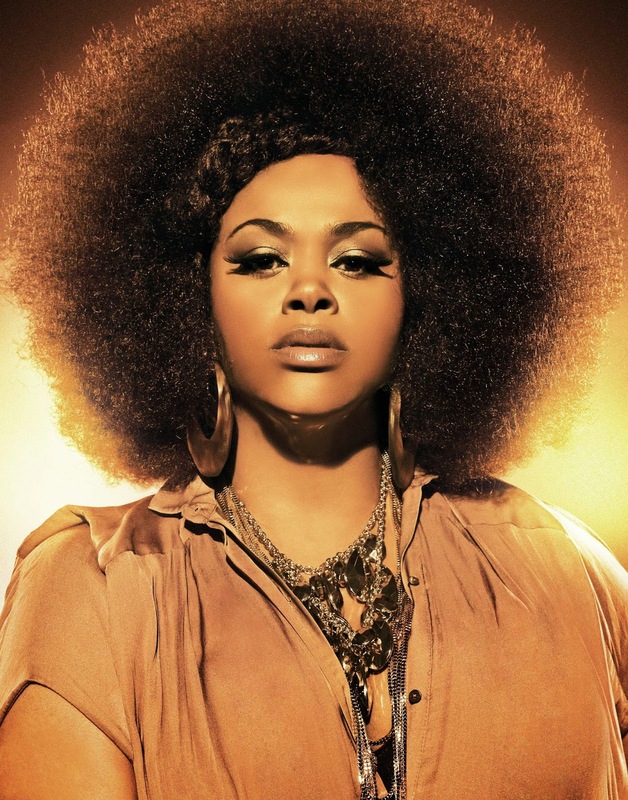 I love Jill Scott she is soooo cool. You have made some gorgeous dresses, well done. Your dresses were beautiful as ever. Congrats on placing! Congratulations! The back on your lace dress is fabulous! Congrats on your win. I'd love to win fabric from Mood. I drool on every PR episode. Congratulations! Your dresses were beautiful and so inspiring! Congrats Julia! I always enjoy reading your posts and you make such adorable (and well-made) garments. Congrats on 2nd place! You created some beautiful things. Congrats! Everything you have made is gorgeous! Hey hey hey! Congratulations! I had already seen the results and was really excited for you! You rock at these sewing competitions! Awesome job, yet again! Congratulations on getting second place - I loved all of your creations! And thank you for the great giveaway! I LOVE Jill Scott. She is my favorite live performer...bar none. What would I do with all the money for mood? The options are endless. New curtains, dogwear, and a shift dress for moi! Congratulations on placing 2nd! Your dresses are SO fabulous. :) Thanks for sharing the love with the Mood giveaway. Very exciting! Congratulations! Your dresses are gorgeous, as always. Thanks for the giveaway! I have a HUGE wishlist at Mood right now. Congratulations Julia on you achievement! Your rose dress looks prettier next to the dress from the movie. Count me in for the Mood voucher! Thanks. Congrats! I loved all the dresses, so pretty and well done! Thank you for the give away! You have had a blessed week haven't you! Jill Scott and winning second place. Fabulous!!! Yay on second place! Your dresses are just so pretty and I much prefer your rose dress to the dress from the film. Please do count me in for the give away! Thank you. Please count me in for the Mood Give away! Yay for you on Project Sewn- lush clothes lady. I'm in for the giveaway, please and thank you. Congrats! Your projects were all amazing. And I am going to have to try that rose sleeve tutorial soon! It's darling. Congratulations! Your work is lovely! Congratulations! I always love your dress creations! And yay for Mood, I hear their fabrics are exceptional! Congrats! Love everything you make, and mood fabric too! Congratulations and well done on the lovely dresses. I'd love to win the fabric giftcard-maybe I could get fabric myself instead of all those baby things I've been making. Awesome finish in the competition! Congratulations! Thanks for sharing the joy with a nice giveaway too! Good job, as always! Congratulations! I am glad Mood fabrics can now go abroad! Congratulations! It was well deserved looking at your dresses. Thanks for the giveaway opportunity! Great prize! Congratulations! Your red dress is a real stunner! You sewed stunning garments beautifully throughout the competition, you're really talented and very creative with your designs. I'd love to see what else you have in your wardrobe...future post maybe? Congratulations! I think you should have won though. I voted for you for every round! Congratulations! Thank you for the giveaway, its a great prize! Congrats with your lovely dresses! 1. You are extremely talented and I'm thrilled you did so well in Project Sewn. 2. I saw "About Time" - loved it and loved Rachel McAdams' character's style, lots of adorable, feminine dresses. i saw About Time at a special advance screening and LOVED IT! so excited to see you have a look-a-like pattern! how cool! Sorry to have missed meeting you on the weekend too. I love your work, especially your mad men inspired and lace dresses. What a great giveaway - I would love to win a mood gift card. Well deserved! I love your style. You have inspired me to get back busy with my sewing. Congratulations on the second place! You did an amazing job with every entry in Project Sewn. And thank you for the give away you are so generous! Congratulations on the placement. Your constructions details look great. I loved all your entries in project sewn and was inspired to make my own butterick 5747 which I should finish this week. International shipping by mood is awesome...I would Love to shop there. I loved all your entries in Project Sewn and I totes thought you should have won. I liked what the winner did, but yours were more wearable and nicer in my opinion :) thanks for the giveaway, so generous!! Congratulations on coming second. This is a great giveaway - thanks. Congrats on your second place win!!! And thanks for holding this great giveaway! All your clothes are gorgeous! I'd like to just copy them all. Great giveaway! I got to go to Mood NYC for the first time last month. I live a little closer than you, but still 3000 miles away. Love your work, And I love giveaways! Congratulations on coming in second! Beautiful work!! Regardless of the giveaway, what an exciting post. Best wishes to you... and when are there going to be more pics of that cute little monkey of yours? Wow, congratulations!! Not only do I like your blog but I love the clothes you make. You are an inspiration for me. Great Job!!! That is so amazing! Congrats!! Oh wow, that dress is crazy similar! Great job on Project Sewn! I enjoyed seeing your creations. Congrats - what an awesome achievement! Congratulations, glad I took the time to vote for you! Well done - I loved your entries! I loved all of your dresses, and the styling of your photos was really cute too! Congrats! Yay! 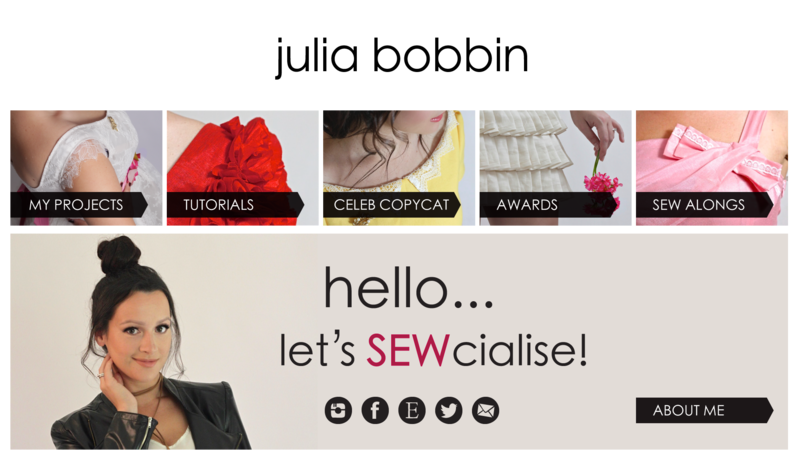 You certainly did some awesome sewing there... and in SUCH a short space of time! But I'm even more jealous you got to see Jill Scott, Had I even known she was in the vicinity I would have been there. It must have been awesome! You did so well! Congrats! Such an inspiration! Your white lace dress is simply stunning! Congratulations!